Kumiodori, Okinawa’s traditional opera dance that’s been a part of the Ryukyu Kingdom for more than three centuries ago, is being presented over the next two weekends at two locations on the island. The free performances take place this Saturday and Sunday from 5:30 p.m. ~ 9 p.m. at the National Theatre Okinawa, and again next weekend, September 13th from 4 p.m. ~ 8 p.m. and 14th from 4 p.m. ~ 9 p.m. There will also be performances at the Kumiodori Cinema at 7:50 p.m. both Saturday and Sunday this weekend. ‘Kumiodori’ It incorporates Okinawan traditional Sanshin and Okinawan songs into Kabuki or Japanese traditional performance ‘Noh’. 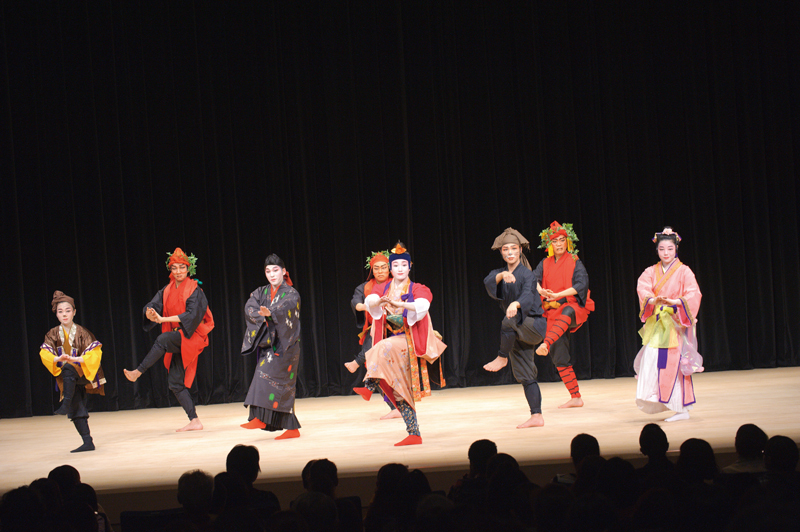 Kumiodori composes dance, lines and music. It has been performed at a reception party for heralds from the Chinese Emperor in Shuri Castle three centuries ago, and was registered as a UNESCO Intangible Cultural Heritage in 2010. It sometimes is not easy for people today to understand ancient speaking and so Kumiodori Cinema has created an easier to understand video presentation. This movie explains the history of Kumiodori and points of view with subtitles as producers try to attract many people to enjoy Kumiodori. This time, it will be performed at the special stage on the grass space outside of the National Theatre Okinawa. Traditional Okinawa opera dance, the Kumiodori, is being performed free at the National Theatre Okinawa. The modern Kumiodori version of ‘Momo Taro’, a folk story everyone knows in Japan, will be played other than Kumiodori Cinema. English subtitles will be prepared this time as a substitute for Japanese as the National Theatre Okinawa welcomes foreign visitors. The Worldwide Eisa Festival will be held on September 13th and 14th. People can enjoy collaboration between Kumiodori as traditional arts and original modern Eisa show.